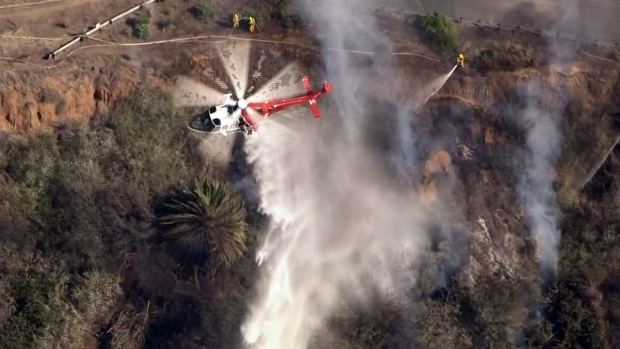 The Colby Fire broke out in the San Gabriel Mountains on Jan. 16, 2014. It burned 1,952 acres, destroying five homes and injured one person. Some 3,600 people were evacuated at its peak. Bracing for one of the worst fire seasons on record, firefighters on Monday sounded a cautiously optimistic tone as they said they were ready for whatever Mother Nature throws at them. During a press conference one year to the day that 19 "hot shot" firefighters died battling a brush fire in Arizona, officials from state and local fire agencies reminded the public about "unprecedented" fire conditions facing drought-stricken California. "Some years we do real good," said Kim Zagaris, State Fire and Rescue Chief at State of California Governor's Office of Emergency Services. "Some years Mother Nature takes a little bit more of an active role against us. "We're ready for wildland fire season and what it brings to us." For the third year in a row, little rain has dropped in the parched state. Twice as many fires were recorded in winter, officials said. Spring fires in the region have burned more like fall conditions, when brush is at its driest and the Santa Ana winds kick up. "It's only going to get worse," said Mike Dyer, Santa Barbara County fire chief. "It's going to be a long fire season." number of fires for the same time period. In May, a fire in San Diego County burned more than 25,000 acres and caused more than $20,000 in damages. Large fires have ripped through Southern California earlier this year. 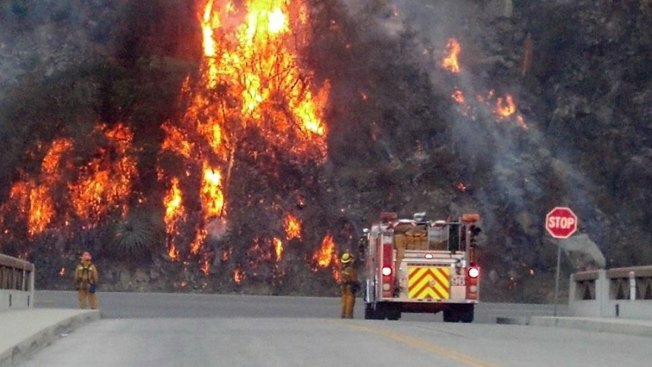 A 1,900 acre fire ripped through Glendora and Azusa in February. The blaze called the Colby fire caused the evacuation of 870 homes. Three firefighters were injured in a Central California wildfire that burned through more than 2 square miles in two days. Firefighters Monday reminded the public of the dangers of lighting fireworks as the July 4 holiday weekend approaches. Police and fire are on alert ready fine fireworks scofflaws. It is illegal to sell, transport, or use fireworks that do not carry the "Safe and Sane" seal. Violators could face fines up to $50,000 or face a year jail, according to State Fire Marshal Tonya Hoover. "You don't want to ruin your celebration by becoming financially responsible for a fire caused by your activities." Correction: An earlier version of this article erroneously stated that Kim Zagaris was a chief with the California Department of Forestry and Fire Protection. Zagaris is a State Fire and Rescue Chief at State of California Governor's Office of Emergency Services.